The Martin Feng Shui Chair is your power chair! Designed with excellent lumbar support, independently adjustable armrests plus height and backrest control, the Feng Shui will adjust to fit your body in every way. It is set on a stable five-star safety base measuring 26” in diameter and is equipped with premium casters for ease in mobility on most surfaces. The drafting height model also includes 15” chrome clad foot ring that adjusts in height to each user’s stature for optimal leg support. 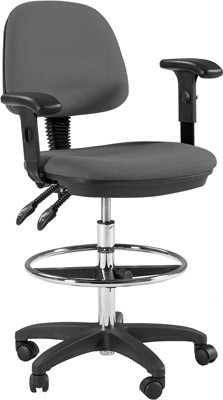 Note: the adjustable armrests are included.